Enhance your network of Christian friends! 1. Access to local groups and activities. 2. Access to group leaders' phone numbers in all areas where there are groups, both local and national. This information is not available to the public. 3. Entrance to all other groups' activities, whether local or regional. 4. 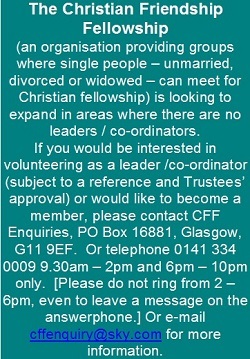 A copy of the CFF quarterly booklet, "News & Views", which gives reports on past events, latest CFF developments and services, details of regional events, any special inter-group activities, articles of interest to single Christians etc. Local group programmes are published in the "News and Views" booklet which is sent or emailed to all members. In order to preserve our high standard of service and integrity, we reserve the right to refuse acceptance of membership without explanation - also to terminate membership at any time without explanation. IF ANY OF THE ABOVE INFORMATION IS NOT CLEAR TO YOU, PLEASE DO NOT HESITATE TO GET IN TOUCH WITH US. WE TRUST THAT WE WILL HAVE THE PRIVILEGE OF WELCOMING YOU INTO OUR CFF 'FAMILY' WITHIN THE NEAR FUTURE. click HERE for an Gift Aid form in PDF format.